If you follow my blog or pop in occasionally, you know I love to create my own flower blossoms. 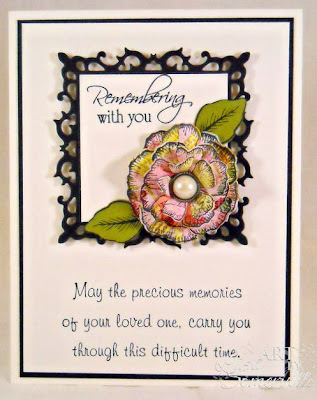 Heartfelt Creations Botanical Floral Stamps along with Spellbinders Rose Creations Die, makes it so easy to create any color blossom you can imagine! 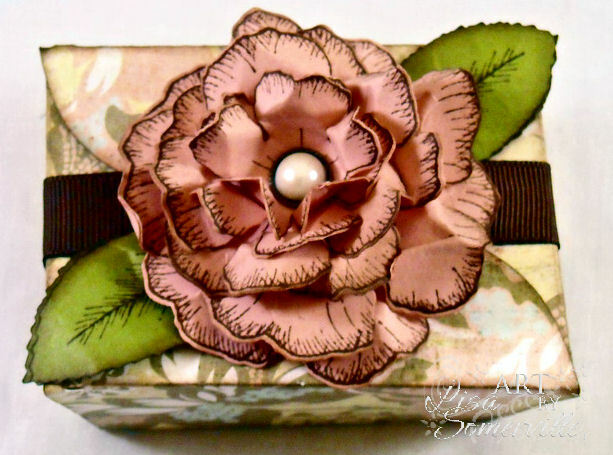 For this project I used the Brownie Box Template, cutting the Basic Grey pattern paper with the Silhouette, sponging the edges and added the beautiful Botanical Floral Blossom created from Pink card stock. I used all 3 blossoms from the Botanical Floral 2 set, stamping each twice and cutting with Spellbinders Rose Creations Die. Sponge edges of petal, pinch and scrunch and layer on top of each other and insert brad into the center. I adhered the blossom to the box with dimensionals from The Sticky Thumb, and added Olive leaves created with this same set and die. For more inspiration, visit the Heartfelt Creations Blog to see what the other designers created. Amazing what you can do with flowers GF! Both are just so beautiful and so you! This is GORGEOUS!!! I just love dimensional flowers and the one you created here is about the prettiest I've seen! I've just put that stamp set on my wish list! So pretty!!! Love the card and box. love this flower-both examples are beautiful and I love your color choices. Thank you for directing me to their website-so much fabulous! Beautiful flowers! The little box and card are amazing and stunning! Stay cool! Gorgeous creations, Lisa! The flowers are really beautiful! both are very pretty, they look great stamped on patterned papers! Both are gorgeous creations! I just love to see your flowers! gorgeous!!!!! you never fail to amaze me!!! Beautiful creations, Lisa! I really love the box! There is a new challenge blog started on 1st of August It's all about the Vintage. We are offering yammy blog candy on August. Pop over to check it out. Hi Lisa ~ What amazing creations on this image! I am inspired by your 2nd image...and how much a difference using patterned paper can make on just changing the technique. Thank you for sharing, it made me "think!" Your flowers are beautiful! I love the one that is several colors! Stunning Flowers! Lovely frame and wonderful design. You are a wizard with your flowers. Beautiful.